This title gives readers an overview of the status, role and function of the "Minor Prophets" in the first century. "The Minor Prophets in the New Testament" brings together a set of specially commissioned studies by authors who are experts in the field. 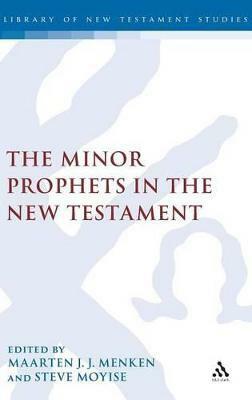 After an introductory chapter on the use of the "Minor Prophets" in the second temple literature, each of the New Testament books that contain quotations from the "Minor Prophets" are discussed: "Mark", "Matthew", "Luke-Acts", "John", "Paul", "Hebrews", "James", "1 and 2 Peter", and "Revelation". Readers are given an overview of the status, role and function of the "Minor Prophets" in the first century. The text considers the Greek and Hebrew manuscript traditions and offers insights into the various hermeneutical stances of the New Testament authors and the development of New Testament theology. Formerly the "Journal for the Study of the New Testament Supplement", a book series that explores the many aspects of New Testament study including historical perspectives, social-scientific and literary theory, and theological, cultural and contextual approaches. "The Early Christianity in Context" series, a part of "JSNTS", examines the birth and development of early Christianity up to the end of the third century CE. The series places Christianity in its social, cultural, political and economic context. European Seminar on Christian Origins and "Journal for the Study of the Historical Jesus Supplement" are also part of "JSNTS". Abbreviations; List of Contributors; 1 The Minor Prophets in the Judaism of the Second Temple Period; Jutta Leonhardt-Balzer; 2 The Minor Prophets in Mark Ciliers Breytenbach; 3 The Minor Prophets in Matthew Clay Ham; 4 The Minor Prophets in Luke-Acts F van de Sandt; 5 The Minor Prophets in John Maarten Menken; 6 The Minor Prophets in Paul Steve Moyise; 7 The Minor Prophets in Hebrews Radu Gheorgita; 8 The Minor Prophets in James, 1&2 Peter Karen Jobes; 9 The Minor Prophets in Revelation Marko Jauhiainen; Index of Quotations and Allusions - New Testament Order; Index of Quotations and Allusions - The Minor Prophets Order; Index of Modern Authors. "European and US scholars of religion, Old and New Testaments, Greek, and systems analysis take the gospels and epistles in turn, identifying and analyzing quotations from and allusions to the 12 prophets of the Old Testament known as the Minor Prophets. Of the 12, Hosea, Zechariah, Habakkuk, Joel, Amos, Micah, Jonah, and Haggai are quoted explicitly. The quotations all occur in the gospels (including Acts), Paul, and Hebrews. Chapters also look at allusions, there being no quotations, in James, 1 & 2 Peter, and Jude and in Revelations." -Eithne O' Leyne, BOOK NEWS, Inc. 'The volume as a whole provides a helpful resource for prophetic study and an essential resource for those examining the use of the Old Testament in the New.' --Sanford Lakoff "After a five-page introduction, this volume presents nine essays on how the Minor Prophets are treated in Second Temple Judaism by J. Leonhardt-Balzer; in Mark's Gospel by C. Breytenbach; in Matthew's Gospel by C.A. Ham; in Luke's-Acts by H. van de Sandt; in John's Gospel by Menken; in Paul by Moyise; in Hebrews by R. Gheorghita; in James, 1 and 2 Peter, and Jude by K. H. Jobes; and in Revelation by M. Jauhiainen." Steve Moyise is Professor of New Testament at the University of Chichester and author of The Old Testament in the Book of Revelation (Sheffield, 1995) and The Old Testament in the New (Continuum, 2001). He is the series editor of The T&T Clark Approaches to Biblical Studies. Maarten J. J. Menken is Professor of New Testament at the Catholic Theological University, Utrecht, The Netherlands.